Unmanned Aerial Vehicles or UAVs are currently being used in agriculture to scout crops, assess drought and flood damage, estimate stand counts, detect nutrient deficiencies, inspect irrigation problems, examine insect infestations, investigate insurance claims, and more. The use of UAVs in agriculture is expected to increase exponentially in the coming years. In fact, multinational professional services firm PricewaterhouseCoopers, with a network of firms in 157 countries, estimates the addressable market of UAV powered solutions for the agricultural industry at $32.4 billion dollars. There are considerable advantages that UAVs bring to the table. From aiding in ground-truthing to replacing a traditional airplane flyover, UAVs can collect more data in less time than traditional tools. However, as with any emerging technology, form must follow function in order to be considered successful. 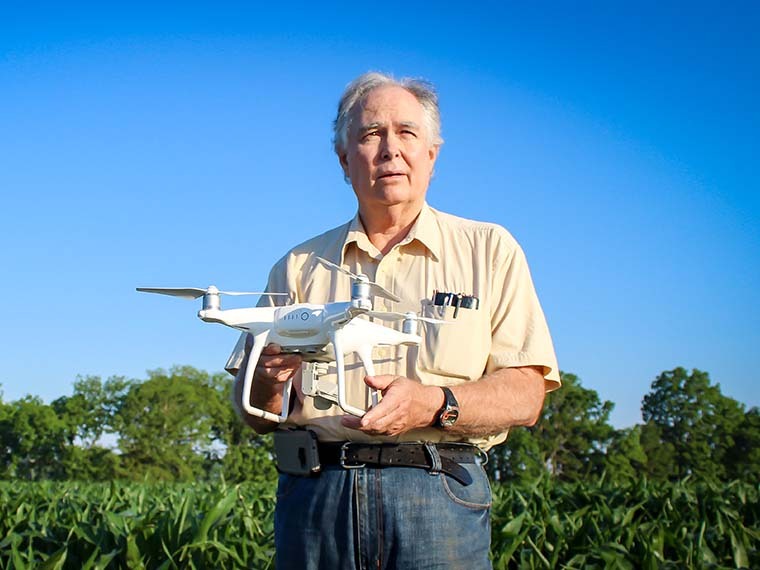 Dr. Wayne Ebelhar, research professor and agronomist in the Mississippi Agricultural and Forestry Experiment Station stationed at the Delta Research and Extension Center, has analyzed UAVs in a variety of research scenarios to help find ways for producers to gain critical information in a cost-effective and timely manner. Ebelhar’s research includes cotton plant yield estimations. Ebelhar assisted agricultural engineers at the U.S. Department of Agriculture in Stoneville. When Drs. Steve Thomson and Yanbo Huang began evaluating ways to improve UAV data collection, they sought a partner to evaluate the data from an agronomic stand point and then deliver the information to producers who would be the ultimate end users. The team used Normalized Difference Vegetation Index or NDVI, a graphical indicator technology available with UAVs. NDVI looks at the greenness of the plant to determine plant health, productivity, and density. In this on-going research, scientists evaluated methods to estimate cotton yield through the use of UAVs. The study found that low-altitude remote sensing with a small UAV can be used for reliable cotton yield estimation based on the plant height. Cotton yield estimation is critical in farming management but traditional methods, like walking an entire field, can be time-consuming, labor intensive, and difficult. The relatively low-cost UAV provides high-resolution digital images that can be obtained and processed in a convenient, timely manner. Ebelhar said the convenience, reliability, and cost-savings of UAVs may mean more money in the pockets of producers, contributing ultimately to greater efficiency in helping feed and clothe more people.